Sunday: 2:00 p.m. - 6:00 p.m.
Monday - Thursday: 5:45 a.m. - 11:00 p.m.
Friday: 5:45 a.m. - 9 p.m.
Sunday: 2:00 p.m. - 5:00 p.m.
Saturday: 10:30 a.m. - 12:30 p.m.
Sunday: 3 p.m. - 5 p.m.
OBU was the first university in the state of Oklahoma and the first top 20 employer in Pottawatomie County to be named as an approved Blue Zones worksite. Learn more about the Blue Zones Project. A life-sized bronze American Bison, sculpted by artist Harold T. Holden, is located in the center's atrium. Holden, from Kremlin, Oklahoma, has created numerous public works of art across the state. 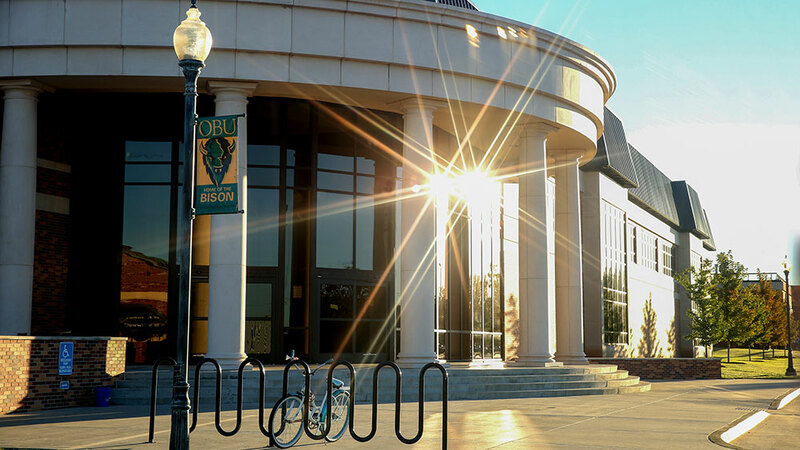 The Bison Spirit is designated as an Official Oklahoma Centennial Project, and reflects OBU's proud heritage on Bison Hill.